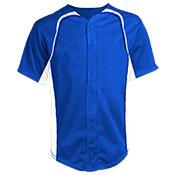 Need custom baseball jerseys quick? We've got youth and adult full button baseball jerseys ready to print and ready to rock on the diamond!! We've got Jerseys With Piping, Sleeveless Full Button Jerseys, and Two Toned Jerseys. All of our full button jerseys are battle tested and perfect for leagues or teams. We've even got the official, real deal MLB Replicas. The best part is we can ship your jerseys quick, just in time for your Opening Day or All Star game. You can upload your logo, team names and numbers, or create your own design with our online design tool!